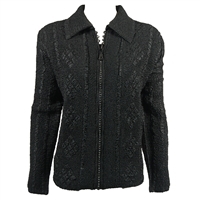 This slinky jacket has a sleek line with no fastenings. Also known as 'tuxedo' or drape style. Coordinates with the tops, skirts, pants and dresses. A wonderful addition to your wardrobe. 90% acetate, 10% spandex. Hand or machine wash. No iron. Made in USA.